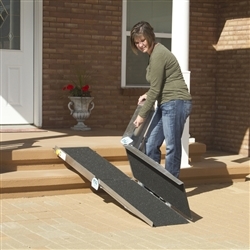 The EZ-Access Advantage Series Suitcase Ramp features a single fold design and works as a simple and convenient solution for wheelchairs and scooters to access steps, vehicles, and raised landings with ease. Improves safety and securing while using scooters, wheelchairs, walkers and canes. Multi Fold Design which was originally developed by PVI makes this larger ramp easy to move from location to location. They can be known as suitcase ramps, they offer a easy portable solution for smaller elevation changes. Single fold and Multi-fold ramps are length-wise folding for easy transportation. Simply unfold the hinged ramp in half to be carried like a suitcase. Some models can be separated, making it even easier to use, carry, and store by simply removing two hinge pins.